Happy New Year everyone! I hope 2011 is one of your best years ever. According to many pundits and year end polls, the iPad was the best technology of 2010. With some 10 million sold since April, the iPad was certainly one of the most popular new devices of the year. As 2010 came to a close, I spent some time revising and updating the first edition of my eBook guide to the iPad. I want to once again thank all those who purchased a copy of the first edition and those who received complimentary copies and sent me feedback. The primary recommendation from readers of the first edition was to include changes due to the arrival of iOS 4.2 in the next release. 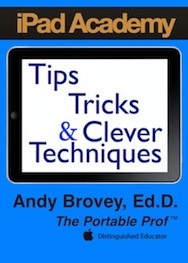 I’m happy to report the second edition of iPad Academy: Tips, Tricks and Clever Techniques is now available. Learn how to supercharge your settings, customize choices and polish your navigation skills. Inside you’ll find easy-to-follow instructions, full-color screenshots, simple shortcuts and dozens of tips. Whether you were an early adopter (like me) or you just got a new iPad for Christmas, iPad Academy: Tips, Tricks and Clever Techniques will save you time, add to your enjoyment and help make you a master of the Apple iPad. I would like to order the ebook version of your book. Can I read it on my iPad AND will i have the option of making notations in the margin? We are deploying iPads to our teachers next week and would like to include the book. Will you be updating your book soon to address the iPad2? If you get the book in ePub format, you can use the notes function to make annotations. Not in the margins but as a pop-up note that attaches to the text where you choose. I know how tight school budgets are and you may be able to save some money. The PDF version is available for free until the end of this month. You and any other teacher can request a copy using the simple form in the sidebar on this blog. I would then suggest getting a copy of GoodReader for all the teachers. $3.99 per copy. GoodReader is one of the most useful programs you’ll find and it includes the ability to mark up and annotate text, even beyond what ePub allows. I do plan a 3rd edition for later in May. Glad to hear of your plan to equip the faculty. You and your fellow teachers will enjoy the new iPads and find them valuable teaching and learning tools. I do offer on site and online training for the iPad and advice on iPad deployment. If I can be of further help, or can answer additional questions about the book, please get in touch. I wish you all the best as you begin the iPad initiative!